We are delighted to announce that Professor Musa Dube from the University of Botswana will be presenting a talk at Chapter House, Exeter Cathedral, on Monday 8th August at 7.30pm. ‘The Bible in the Bush: Translating and Reading the Bible in Africa’ will introduce and explore some of the themes which arise from biblical interpretation in African contexts. Professor Musa Dube is currently Professor in the Faculty of Theology and Religious Studies at the University of Botswana. She is a member of the United Methodist Church, the Circle of Concerned African Women Theologians, and the Society of Biblical Literature. Her research focuses on postcolonial and feminist readings of the Bible, theological issues surrounding HIV and AIDS, and translations and interpretations of the Bible in Africa. on African Biblical Interpretations (Society of Biblical Literature, 2012), The HIV and AIDS Bible: Some Selected Essays (University of Scranton Press, 2008), and Postcolonial Feminist Interpretations of the Bible (Chalice Press, 2000). In 2011 she was awarded the Friedrich Wilhelm Bessel Research Award by the prestigious Humboldt Foundation (Germany) in recognition of both her academic and community oriented work on postcolonialism, HIV&AIDS and biblical studies. Her expertise is guaranteed to make this an insightful and engaging talk, both for those with prior knowledge of the subject matter as well as those new to the topic. Entry to the event is free, and all are welcome. Refreshments will be served afterwards. 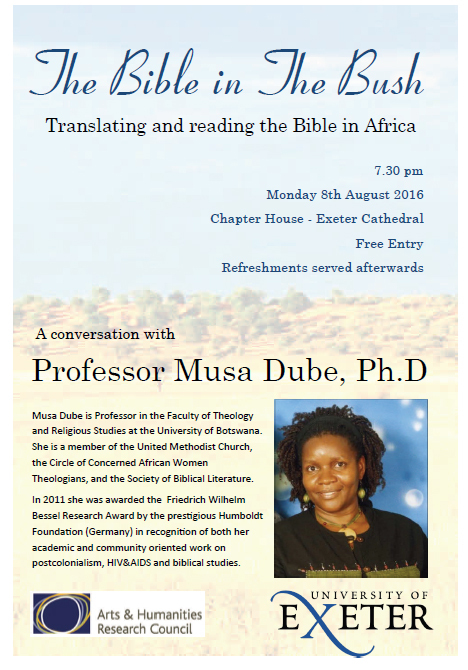 ‘The Bible in the Bush: Translating and Reading the Bible in Africa’ takes places at Chapter House, Exeter Cathedral, on Monday 8th August 2016 at 7.30 pm. Free entry. Directions: Chapter House is located to the right of the Cathedral’s main entrance, through the small garden with black railings.